Stocks under $5, such as eDiets.com and Opnext, more than doubled in February. BOSTON (TheStreet) -- Stocks under $5, such as eDiets.com (DIET and Acceler8 Technology (AXK, have doubled this month, squashing the broader market and surprising investors who haven't heard of the penny-stock companies. Almost 1,000 stocks under $5 on major U.S. exchanges are up only 2.4% in February, in line with the benchmark S&P 500. Last Friday, the S&P 500 had traded at its highest peak since the financial crisis started in September 2008. Protests across the Middle East sparked a rally in crude prices and triggered a pullback in equities. Analysts expect stocks under $5, like Citigroup ( S and Sprint Nextel ( S, will outperform this year, but those companies haven't been among the biggest winners in the new year. Instead, penny stocks including Evergreen Energy ( EEE and Independent Bank ( IBCP have surged as much as 500%. Investors in penny stocks must be extremely careful with their investments, as their risks are among the highest in securities trading. For example, First Community ( FCFL dropped nearly 75% in February to 33 cents, Integra Bank ( IBNK has tumbled 59% this month to 31 cents and LECG Corp. ( XPRT is down 58% to 67 cents. The risk of a sharp, quick selloff is elevated for investors in these companies. Fresenius Kabi Pharmaceuticals ( APCVZ contingent value rights (CVR) rallied nearly 60% in February until an announcement on Wednesday wiped out that gain and more. In September 2008, Fresenius paid $23 in cash to acquire APP, although the deal also included a variable component of up to $6 depending on APP's adjusted earnings before interest, tax, depreciation and amortization (EBITDA) through 2010. However, adjusted EBITDA didn't meet the required threshold. Shareholders hoping they were holding a winning lottery ticket are instead left with nothing. The Fresenius CVR shares dropped more than 80% during Wednesday's trading session. Still, many inexpensive stocks have generated huge returns for lucky stock pickers. The following pages detail the best-performing stocks under $5 in February, ranked by total return for the month. Company Profile: Neoprobe is a biomedical company that develops surgical and diagnostic products. The stock transferred from the OTC Bulletin Board to the NYSE Amex on Feb. 10. The stock hit a high of $3.93 on Feb. 16, two days after Neoprobe said a Phase III clinical trial of its Lymphoseek diagnostic, which identifies cancerous lymph nodes, reached an "accrual goal." Analyst Ratings: Despite the upgrade to the NYSE Amex, TheStreet Ratings has a "sell" ranking on Neoprobe, noting the company's "weaknesses can be seen in multiple areas, such as its weak operating cash flow and feeble growth in its earnings per share." Wall Street firms are more bullish on the company, with one analyst rating the stock a "buy" and two others saying Neoprobe shares will outperform. Company Profile: Nexxus Lighting makes light emitting diode (LED) and fiber optic lighting products primarily in the U.S. While most LED stocks struggled in February, Nexxus Lighting climbed on a Feb. 8 announcement that its Array LED bulbs are included on the Energy Star-qualified LED light bulbs list. Analyst Ratings: TheStreet Ratings has a "sell" rating on Nexxus Lighting, noting the company's "unimpressive growth in net income, poor profit margins and generally disappointing historical performance in the stock itself." Among Wall Street analysts, the only two analysts following Nexxus Lighting have a "buy" rating on the stock, according to Capital IQ. Company Profile: Fonar sells magnetic resonance imaging (MRI) scanners for the detection and diagnosis of human diseases. The stock soared Tuesday after the company said it swung to fiscal second-quarter net income of $1.4 million, reversing a year-earlier net loss of $1.3 million. Analyst Ratings: TheStreet Ratings has a "sell" rating on Fonar, noting a variety of negative investment measures "should drive this stock to significantly underperform the majority of stocks that we rate." No Wall Street firms cover the stock. Company Profile: Emcore provides compound semiconductor-based components and subsystems for the fiber optics and solar power markets. Shares followed JDS Uniphase higher after the optical products maker on Feb. 3 reported blowout results for the recent quarter and raised guidance. Analyst Ratings: TheStreet Ratings has a "sell" rating on Emcore, saying that the company's "poor profit margins" have been the most notable of several weaknesses. No Wall Street firms cover Emcore. Company Profile: Silverleaf Resorts develops and acquires timeshare resorts, and markets and sells one-week annual and biennial vacation intervals to new owners. The stock rallied after hedge fund Cerberus Capital announced a $94 million buyout of the timeshare operator. Analyst Ratings: TheStreet Ratings has a "hold" rating on Silverleaf Resorts, highlighting the company's revenue growth, solid stock price performance and attractive valuation. However, TheStreet Ratings also notes Silverleaf's "generally poor debt management and poor profit margins." 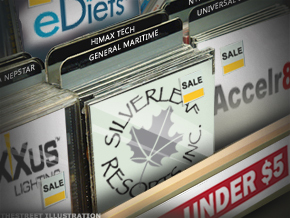 Silverleaf is not covered by any Wall Street analyst. Company Profile: Repros Therapeutics is a development-stage biopharmaceutical company that develops oral small molecule drugs for major unmet medical needs that treat male and female reproductive disorders. The stock rallied sharply higher in early February after the company announced an offering of common stock and warrants, which CEO Joseph Podolski said offers the company funding into mid-2012 for clinical trials of its drugs Androxal and Proellex. Analyst Ratings: TheStreet Ratings doesn't cover Repros Therapeutics. Only one Wall Street firm follows the stock, rating it a "buy" with a $6 price target. Company Profile: Superconductor Technologies makes infrastructure products for wireless voice and data applications. The company provides interference elimination and network enhancement services to the commercial wireless industry. The shares rallied after the company said on Feb. 2 that it successfully produced second-generation samples of its high temperature superconducting, or HTS, wire products. Superconductor expects to begin deliveries of the samples soon. Analyst Ratings: TheStreet Ratings has a "sell" rating on Superconductor's stock, highlighting "unimpressive growth in net income, disappointing return on equity, poor profit margins and weak operating cash flow." Only one Wall Street firm follows Superconductor, rating the stock as a "buy" with a $6.75 price target. Company Profile: Acceler8 Technology develops materials and instrumentation for applications in medical instrumentation, basic research, drug discovery and bio-detection. The stock surged in the absence of any headlines in January, prompting an inquiry from the NYSE for the unusual volume activity. Acceler8 shares again spiked in February after the company said an evaluation agreement with Novartis ( NVS was extended to June 30. Novartis will pay the company a monthly fee for an exclusive right extension that runs through April 13. Analyst Ratings: TheStreet Ratings has a "hold" rating on Acceler8's stock, arguing that the company's "robust revenue growth, largely solid financial position with reasonable debt levels by most measures and notable return on equity" are counterbalanced by the company's "poor" profit margins. No Wall Street firm covers Acceler8 Technology. Company Profile: Opnext sells subsystems, optical modules, and components that transmit and receive data delivered via light in telecommunications, data communication, industrial and commercial applications. On Feb. 3, Opnext offered fiscal fourth-quarter revenue guidance that was above analysts' estimates. Analyst Ratings: TheStreet Ratings has a "sell" rating on Opnext, primarily due to the company's poor profit margins. "Regarding the future course of this stock, we feel that the risks involved in investing in OPXT do not compensate for any future upside potential, despite the fact that it has seen nice gains over the past 12 months," TheStreet Ratings wrote in a Feb. 20 report. Among Wall Street analysts, two firms have a "buy" rating on the stock and another has a "hold" rating. The average of two price targets on Opnext shares is $3.40. Company Profile: eDiets.com develops and markets Internet-based diet and fitness programs to consumers and businesses. Shares rallied sharply higher along with Weight Watchers ( WTW, which saw shares surge on better-than-expected results for the fourth quarter. Analyst Ratings: TheStreet Ratings has a "sell" rating on eDiets.com due to "deteriorating net income, weak operating cash flow and generally disappointing historical performance in the stock itself." Among Wall Street analysts, one firm covers the stock with a "hold" rating and $1 price target. >To see these stocks in action, visit the Top Stocks Under $5 portfolio on Stockpickr.